Invasive pets can damage the environment and our native species. The pet and aquaria trades are sources of new species which have the potential to become invasive in Ireland. Although the vast majority of pet owners are responsible and well informed, the growing availability of exotic pets means that more and more people have pets that have the potential to be invasive if they escape or are released into the natural environment. Pets may predate on native wildlife, compete with native plants and animals for resources, and introduce and spread diseases. 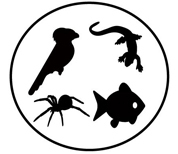 Even pets which we do not consider particularly exotic such as cats, rabbits or goldfish, and other fish species can have major negative impacts on native biodiversity. Breeding seabird colonies on islands are particularly vulnerable to species such as cats and rats. Pets which grow very large, reproduce easily and in large numbers or which require specialised care are the most likely types of exotic pets to be introduced into our native environment either as a result of accidental escape or release by their owners. Be Pet Wise to the threat of invasive pets and never release pets into the wild and keep them in such a way that they can’t escape. Find out how you can make more informed choices about your pet and how to keep them. Preventing pets from becoming invasive is in the interest of all traders. Traders can Be Pet Wise and responsible with pet species by adapting some simple measures to prevent species from becoming invasive. Traders can also actively encourage others to take appropriate action.